. 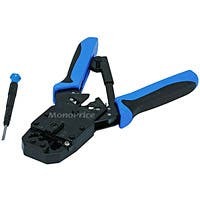 - Professional Modular Crimps, Strips, and Cuts Tool This tool is designed with 8 position punches.For crimping the ordinary 8P8C plug. This kind of 8P plug without additional cavity on each side.Built-in round cable stripper.